This blog post will go over the application architecture used to create mobile bar code scanning applications that take advantage of a reusable framework, design patterns, and a layered approach. We have several applications that run on mobile scanner devices running Windows Mobile OS (Example: Intermec CK31 device). This layered approach works for applications developed natively using the .NET Compact Framework as well as applications developed using the full framework running over a terminal server. I got involved in developing a new mobile scanning application recently, so I went over the source code of our previous scanning applications and found a big problem: Old mobile scanner applications were not layered or structured in a way that made architectural sense, were not easily understandable, and the code was tedious to look at yet alone update. I also looked for ways I could refactor the code to make it generic and reusable. Previously, all of our scanning applications had code to handle basic tasks like accepting input into a text box, validating the contents, moving to the next field to scan, checking for the proper qualifier (the beginning character of the scan), etc, but in addition to the items listed above, the code was not re-usable and looked like a garbled mess. I created a project titled ScannerInput to encapsulate the functionality and validation that was typical in our bar code scanning applications. The project encapsulates all of the logic required for scanning functionality for our mobile scanning applications and its object model supports extensibility in functionality so that features such as custom validation can be implemented in a structured and clean way. In addition, the application framework internally references the user interface components to provide tighter control and logic flow within the UI elements. Internally, when the TextBoxControl property is assigned, the ScannerInput class adds its own event handlers to the control. For example, it handles the KeyPress event to know when to validate the contents of the field. The ScannerInput code handles all of the logic and user interface control flow such as navigation between text boxes as input is scanned, preventing changing focus of text boxes if validation hasn’t passed, validating qualifier, and validating scanned data. In four lines of code we now have a text box that is jacked into the scanning routine of the framework. 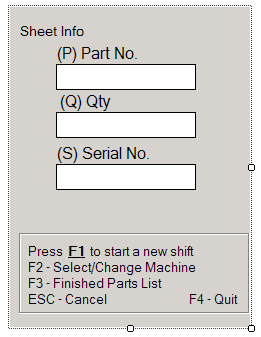 Now, it will easily accept and validate scanned input. If scanned data is valid it will move on to the next text box for more input or can be directed to open another form or do any other programming task as events are raised back to the client that the client can handle and do what it likes if it chooses to. The strategy pattern is used for the validation piece of the architecture. As data is scanned into a field, the contents need to be validated. Here is the Interface used for the strategy and a couple of examples of the strategy implementation. _ErrorMessage = "Invalid Shift Entered"
The nice thing here is that there are generic validators to validate simple things like numeric values, or field length ranges. A validator could easily be written and re-used to check a database table to see if an item scanned, for example, is an actual item that exists in a backend database. This could be done without modifying any of the ScannerInput project files, but simply by passing in the instance of the validator to the New constructor of the ScannerInput instance. Looking back at our old way of doing things, we had scanner input control logic intertwined with validation code along with constants used to specify the qualifiers used for each field- etc… and all of this was in a single code file – it was unsightly. Now, if you are wondering.. What if you want to have multiple validators validate a ScannerInput object? The New constructor of the ScannerInput object has only one validator parameter option, but you can easily bundle calls to multiple validators by creating a new class object of type IScannerInputValidater that internally uses multiple validators or has the capability to add validators to a collection at runtime and use them by sequentially calling the validate method of each one. An instance of the object would just need to be passed into the New constructor if the ScannerInput object. I just want to briefly describe the application used to develop and test the Mobile Scanner Application Framework. The client application was designed using an n-Layer approach (UI, Data, Business, and Facade layers), ORM mapping, and the Microsoft Enterprise Library Logging and Instrumentation Block. Future mobile scanning applications can use the Mobile Scanner Application Framework by referencing the ScannerInput project from the user interface layer and simply create ScannerInput objects and assign them a few properties (as we saw in the code samples above). The ScannerInput project takes care of the sequential program flow and validation of data scanned into the text boxes. There is very little code in the UI client project in comparison to our previous scanning applications. 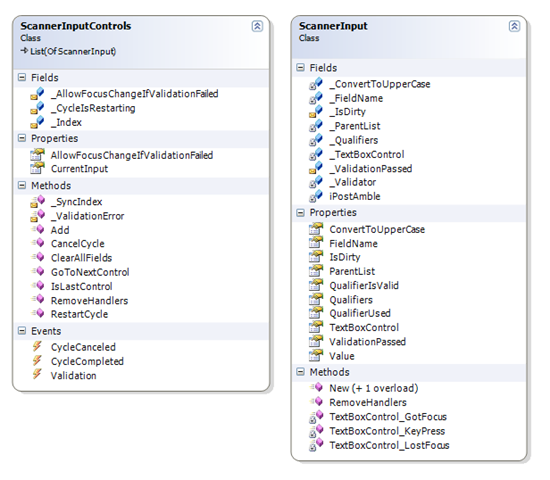 Most of the code in this new approach is creating a couple instances of ScannerInput objects and assigning their properties and then handling the events raised back to the client by the ScannerInputControls list object. In this case the letter in brackets indicates the qualifier (first character(s) in the scanned input required to be there to be considered valid (handled entirely by the framework). Each text box is tied to a ScannerInput object (see code example above) which handles validation and sending error notification back to the client to handle – in this case the client handles it by displaying a validation error message on the client form. As scanned input is completed the framework takes care of moving between fields. Bugs are easier to track down and fix – you can see this as it is very easy to identify where validation takes place, user interface code, and mobile scanning code takes place. Couple this with a well designed user interface (layers, best practices, etc) and you have an easy to maintain application. Adding a new text box for scanner input to the form requires 3 or 4 lines of code to hook it up into a ScannerInput object. The old way would have required copying and pasting event handlers and creating a new method in the code file for its own validation routine, etc. Client applications can benefit by enhancements to the program flow and logic contained within the framework immediately as they are developed. Note: I don’t have the ScannerInput project source code posted to this blog right now. I am hoping to find some more time very soon to revisit this and post the rest of the code including the internals of the ScannerInput object. If you are looking for more information in the meantime please contact me or leave me a comment.